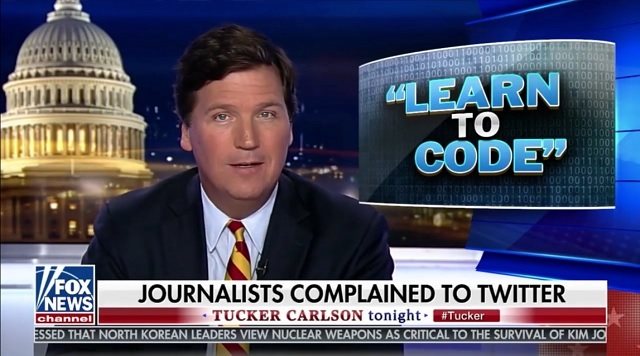 Tucker Carlson on Tuesday night covered the story of right-wing Twitter telling laid-off journalists to "learn to code" and laughed at the meme saying it was "perfect." He also covered Twitter's ensuing crackdown on the phrase whereby they claimed it's "targeted harassment" to tell a laid-off journos exactly what journos told laid-off coal workers after Obama regulations shut their plants down. TUCKER CARLSON: Well, the past couple of weeks have been pretty awful for American journalists, hundreds of reporters and editors at places like the Huffington Post and BuzzFeed lost their jobs, victims of systemic changes to their industry. No matter what you think of those sites, it�s sad. Anyone who has lost his job knows that it is very tough. Here's a selection of headlines you might remember on that subject. This one is from NPR, �From coal to code: new path for laid-off miners in Kentucky�. From Wired, the tech evangelist magazine, �Can you teach a coal miner to code?� From CBS News, �Out of work coal miners find new work in computer industry�. And this from Bloomberg, �Appalachian miners are learning to code�. And from the venerable New York Times, �The coders of Kentucky�. See? It is that simple. Let's say that you spent 30 years making a solid middle-class living in a paper mill in northern New Hampshire, then one day the mill spouts down, sold for scrap to China. Happened a lot. But no problem, just learn to code. Everyone in Brooklyn is doing it. Well, coding was never a real solution to any of this, obviously. But it had the effect of making journalists feel even more self-satisfied. And of course that was the point, it�s always a point, actually. Fast forward to this month. Someone on Twitter came up with a pretty brilliant piece of advice for all of those laid off journalists trying to figure out what to do with their lives. �Learn to code�. Perfect. Suddenly learn to code was everywhere on Twitter. But journalists did not see the humor in this at all. A former New Yorker employee called Talia Lavin called the phrase, quote, �far-right hate�. People who went to Wesleyan and should not have to �learn to code�. So that they complained to the censorship of authorities at Twitter, who immediately concluded that asking someone to �learn to code� might be, quote, "targeted harassment." But, only when it is directed at people who used to work at BuzzFeed. For the paper mill guy in New Hampshire, coding is still a future.